Toss aside your Fitbits and FuelBands. This is only the device you’ll ever need. 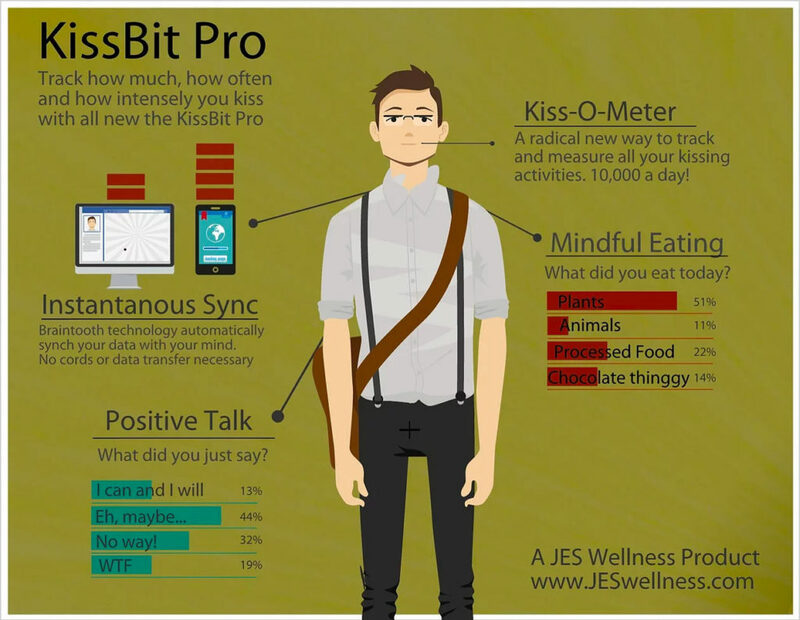 The JES KissBit Pro. Finally, there’s a way to track the most important metric of all — how much love you’re giving and receiving on a daily basis. Having a steady flow of kisses is a sign of healthy relationships and emotional wellbeing. In fact, kissing has been shown to boost your immune system reduce blood pressure, and decrease stress. We recommend 10,000 kisses a day to healthier you. What’s more is that the KissBit will also track everything you’re putting into your mouth. No more cumbersome logging of food intake. The KissBit’s Braintooth technology seamless integrates kissing into your life by automatically syncing to your brain. This way the KissBit knows exactly what and how much you’re eating. It even will start vibrating if you’re not chewing your food thoroughly. No more cheating on your food log. If you want to eat mindfully and lose weight, It’s the ideal device for you. Finally, the newest Pro Version also tracks what comes out of your mouth too. With the KissBit you don’t need to worry about speaking before you think. Now you can finally put a check on all those poorly articulated judgments, criticism, comments. The KissBit ensures your words reflect a positive and healthy attitude. You can even use Use online graphs, charts and badges to track your progress. Gain insights into your verbal trends and challenge friends and family kiss more and shout less. p.s. If any engineers or developers want to help me design this, shoot me a message right away.